I decided last night to start a regular notes column, most likely on Wednesdays. This way I can take a look at things going on around baseball each week and cover as much ground as possible. So without further ado(and much procrastination), here are your Wednesday notes. Tonight is Game One of the 2012 World Series, as the Detroit Tigers will be taking on the San Francisco Giants. Most experts are predicting the Tigers to come out on top, as their pitching has been superb this postseason with a potent offense. Far be it from me to doubt the Cyborg Verlander, but my gut is telling me to not doubt the Giants. They have been the underdogs throughout the playoffs, coming back from the edge of elimination during both the NLDS and the NLCS. They even came back from being down 3-1 against the Cardinals to punch their ticket to the World Series. The only other time it’s happened? The 1985 playoffs by the eventual champion Kansas City Royals. Yes, they did it against the Cardinals that year in the Fall Classic. Game 7 the other night was oddly reminiscent of another Game 7, of that same 1985 World Series. For anyone who doesn’t know, in that game the Cardinals veered off the rails and the Royals routed them in classic fashion. Joaquin Andujar blew a gasket that game, demolishing a toilet in the locker room while Whitey Herzog was ran up by the umpires while his Red Birds choked in epic fashion. I almost expected Andujar to make an appearance Monday night, being carried off the field by Cardinals enabler Mike Matheny. Alas, it didn’t happen but we still got our rout of the Cardinals. Anyway, back to my point, which I lost while reminiscing about the Royals actually winning meaningful games. The Giants have defied the odds all season, so it doesn’t seem right to doubt them now. They have three characteristics that any winning team needs: they know how to win, they are clutch and they have heart. They are also unorthodox, but that isn’t as normal as the other items. This Giants team has pitching, way better defense than the Tigers, and are clutch. So don’t count this Bay Area bunch out just yet. So here goes: my prediction is the Giants in 7. Probably the best acquisition before the trade deadline this year is the Giants getting second baseman Marco Scutaro from the Rockies. Scutaro had been traded in the offseason by the Red Sox to Colorado, where he just languished with the under performing Rockies. The Giants needed a middle infielder, and they hit gold with Scutaro. Scutaro caught fire and hit .362 in 61 games for the Giants, solidifying the top of the order after Melky Cabrera was suspended(ie. played the part of a big dummy). 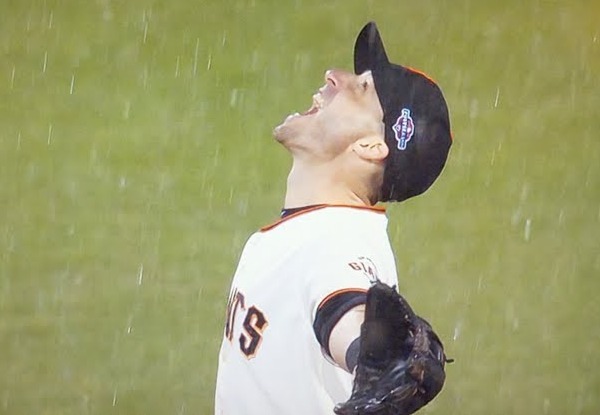 Scutaro hasn’t stopped as he is now the MVP of the NLCS and headed to the World Series. All this from a guy who didn’t even make the majors until he was almost 27. He has had to fight his entire career, so this is no different. Scutaro is a guy you cheer for, a guy who has to work twice as hard as everyone else. 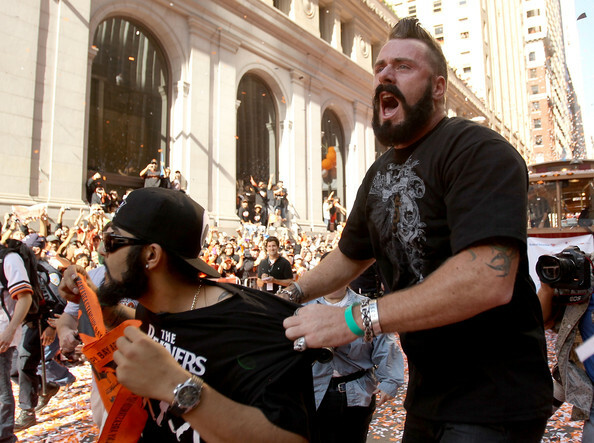 If you needed another reason to root for the Giants, I just gave you one. Even in picture I can hear Ozzie cussing. 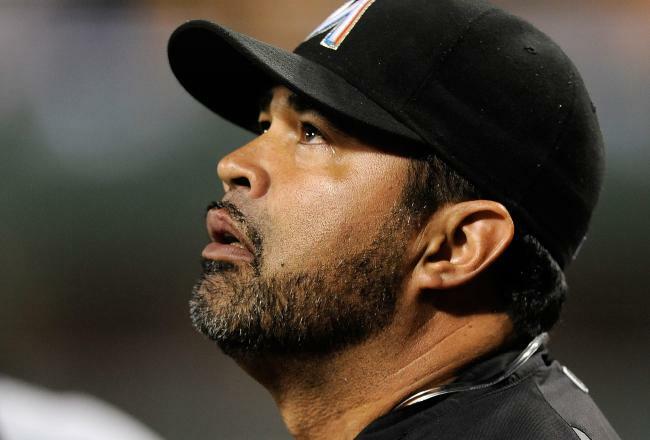 Yesterday word came down that the Miami Marlins were parting ways with manager Ozzie Guillen after one year. No one should be surprised by this. For one, the Marlins got off to a bad start and never found a real groove. Add in Guillen’s comments about Fidel Castro, less than stellar attendance at their new stadium and his war of words with former closer Heath Bell and it was just a matter of time before Ozzie got the hook. Guillen has always been a very outspoken manager, and this was no different. When Guillen managed the White Sox, I always wondered how his team put up with his show. I mean day after day, it’s Ozzie with permanent diarrhea of the mouth. At some point those players HAVE to just tune him out. Add in owner Jeffrey Loria’s tendency to fire his managers on a whim(just ask Joe Girardi and Fredi Gonzalez about that) and it was just a matter of time until Guillen had his bags thrown out on the lawn. To be perfectly honest, this is the best for the Marlins, and hopefully they make a good hire for manager. I would highly recommend Brad Ausmus, but he doesn’t seem to be interested being in Miami. No matter what, this is a team that needs to rebuild(again) and it might be time for them to hire someone under the radar. Boston got their man. 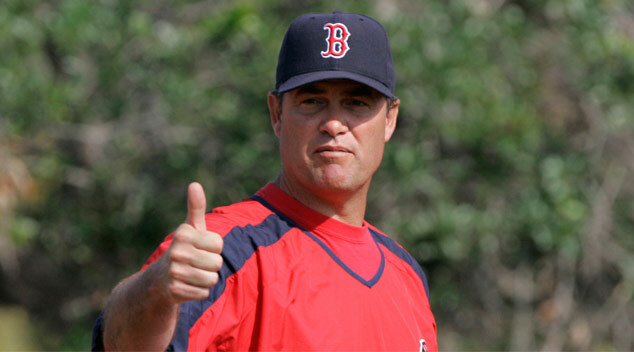 John Farrell is the new Red Sox manager, as the team worked out a deal with the Toronto Blue Jays to bring him to Boston. Beantown is not new to Farrell, as he was the pitching coach for years in Boston under former manager Terry Francona. He was well liked in the Boston clubhouse and was a favorite of the players. I think this is great move by Boston and was GM Ben Cherington’s original choice last year, but was outvoted by the Boston owners. Now, the part of this I found interesting was that Toronto’s compensation for Farrell going to Boston is shortstop and former Royal Mike Aviles. I’ve always been an Aviles fan, but Boston just fleeced Toronto. 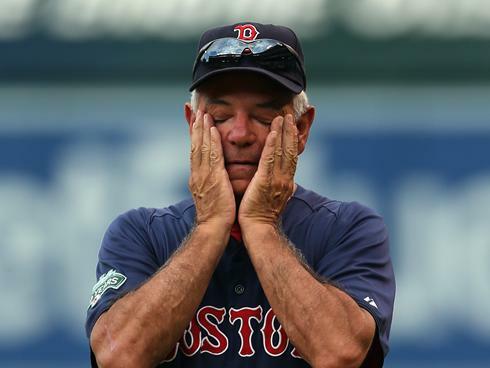 John Farrell will be a good major league manager, while Aviles will be…well, Aviles. Which means he is a solid starter but probably a better fit as a solid backup that can fill in if someone gets injured. I don’t know for sure what Toronto is thinking, but if you are keeping score at home, I believe the score is Boston 1, Toronto 0. That expression…that is how most Red Sox fans felt this season. Speaking of the Red Sox, yesterday in an interview, former manager Bobby Valentine continued his scorched earth tour, saying that star hitter David Ortiz decided not to play the rest of the season after their big blockbuster trade with the Dodgers that signaled Boston waving the white flag on the season. Look, I’m not going to go into whether or not I think Ortiz was actually hurt or just gave up. Either way, what is more interesting is that Valentine continues to burn bridges left and right. I get that Valentine was probably blamed for some stuff he had nothing to do with, and was the scorn of a lot of Red Sox fans this past season. I’m sure being the Red Sox manager is a major pressure cooker, but this is just uncalled for. Part of being a manager is to have your players back, and Valentine doing this would make any player think that if he played for Bobby there wouldn’t be that level of trust. Unless that is the point. Maybe Bobby V is done managing. Maybe this was the last straw. If so, it is an awful way to go out. But he also made his own bed. Time to sleep in it. Wouldn’t he look good in Royal blue? Finally, I love trade rumors, especially this time of year. So many possibilities that are endless and mostly purely fictional. But there was one floating around last week that interested me. Someone threw out there that the Royals were interested if the Tampa Bay Rays make star pitcher David Price available. It’s no big secret that the Royals main priority this offseason is pitching and the team has no true number one starter on the team. Price would be that, easily. But this got me to thinking. What if the Royals can’t get Price, but would still like some pitching? Tampa has a gluttony of arms, and I can’t see them not being interested in some young talent if the Royals are willing to deal. My choice would be Jeremy Hellickson who has been on my wish list for a couple years now. I would have to think the Royals could scrounge up some prospects that would make the Rays interested. The name bandied about for Price was Billy Butler, which might be a tad high for Hellickson. But let’s be honest here; the Royals need to do something. I can easily see the Royals parting ways with a Butler, Moustakas or Hosmer if it nets them a top of the line starter. I would hate for any of those guys to leave, but to receive talent you have to trade talent. Time will tell, but if Kansas City is smart they will further conversations with the Rays and see if they work something out. You can only hope it is not a debacle like the Cabrera for Sanchez deal that went down last year.